How to watch Around the World in 80 Days (2004) on Netflix Canada! Sorry, Around the World in 80 Days is not available on Canadian Netflix, but you can unlock it right now in Canada and start watching! With a few simple steps you can change your Netflix region to a country like South Africa and start watching South African Netflix, which includes Around the World in 80 Days. We'll keep checking Netflix Canada for Around the World in 80 Days, and this page will be updated with any changes. Around the World in 80 Days is not available in Canada BUT it can be unlocked and viewed! After betting the Minister of Science that he can circle the world in 80 days, eccentric inventor Phileas Fogg sets out on an epic adventure. A bet sends an inventor, his valet and a pretty artist on a wild balloon adventure. Happy landings! There is a way to watch Around the World in 80 Days in Canada, even though it isn't currently available on Netflix locally. What you need is a system that lets you change your Netflix country. With a few simple steps you can be watching Around the World in 80 Days and thousands of other titles! 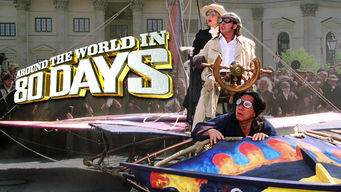 Watch "Around the World in 80 Days"